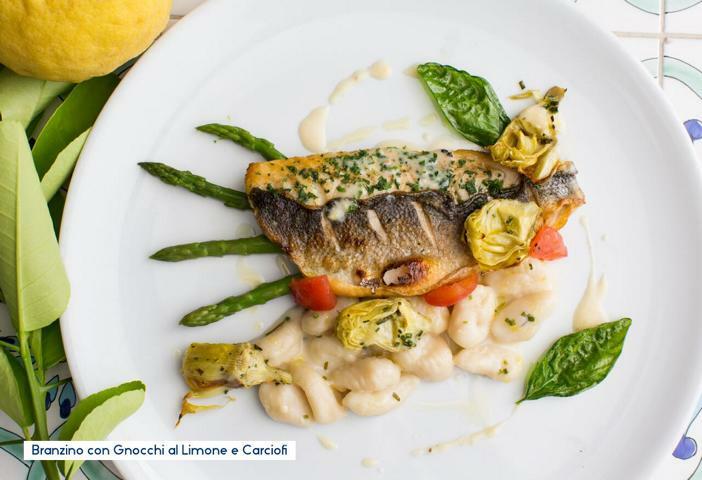 Branzino con Gnocchi al Limone served at Amalfi. HOUSTON – (By Michelle Leigh Smith) – It is not only Italian businessmen who pack Amalfi around 3 p.m. each afternoon. Dads bring their sons after soccer and beautifully dressed women come in trios for the fresh Salmon Scozzese or Branzino con Gnocchi al Limone E Carciofi or a simple Fichi Con Proscuitto Di Parma E Balsamico (imported Parma prosciutto with fresh black mission figs drizzled with aged balsamic vinegar). Chef Giancarlo Ferrera opened Amalfi Ristorante Italiano & Bar three years ago, immediately gaining recognition on Alison Cook’s Top 100 Restaurants list. Amalfi’s open design by Crafft Studio and Architects Filo Castore and Chris Leisher shows attention to detail. Yellow roses on the white tablecloths bring out the brilliant yellows in the tile from Vietri. The superb wine list will include Ros’Aura by Feudi di San Gregorio rose for Houston Restaurant Weeks. Amalfi, 6100 Westheimer, will kick off Houston Restaurant Weeks (August 1-September 4) with a three-course dinner menu for $45. The Ferreras will donate $7 to the Houston Food Bank for each dinner sold. When Martha Stewart visited Amalfi when the Super Bowl was here. “She loved it,” says Lisa Ferrara, the chef’s wife. What did Stewart order? Branzino al Sale (whole Mediterranean Sea Bass encrusted in rock salt and cooked in the wood burning oven). And for dessert, she had Pasticceria Amalfi, a homemade selection of miniature macaroons, chocolate truffles, chocolate horns with dark mousse and fruit tarts, panna cotta nocciola and Cannoli with ricotta cheese. Chef Ferrera, born into a culinary family in Italy, worked at the 2-star Michelin restaurant Patrick Guilbaud in Dublin where he perfected the nuances of French cuisine. Then he arrived at Houston’s Arcodoro, where he served as Executive Chef for 12 years. His special touches – using capers instead of salt, pairing Sea diver scallops with baby zucchini mousse and Chanterelle mushrooms and black truffles – should not be missed. Cleverley Stone founded Houston Restaurant Weeks in an effort to end hunger in the Bayou City. This year, she has more than 250 restaurant operators who have committed to donating a percentage of the proceeds to the Houston Food Bank. It’s a great way to experience posh destinations that otherwise might not be in the family budget. Arthur Mooradian, the general manager of Houston’s Del Frisco’s Double Eagle Steak House in the Galleria, was the No. 1 donor to the Food Bank from HRW for several years. “If you were to order the items on most of these menus separately, it would cost far more than the special pricing offered during HRW,” says Mooradian. Del Frisco’s distinctive dinner menu entices new diners with 12 oz. filet mignons, Crab Cakes in Cajun Lobster Sauce and thin green beans, for $45. This year, there’s a $25 dinner menu at White Oak Kitchen, for pistachio-crusted salmon and or Shrimp Pad Thai. Out west, the South American fare at Sal y Pimienta Kitchen in CityCentre boasts a $35 prix fix dinner menu or $20 special lunch menu. Explore the seafood brochette or butterfly grass-fed tenderloin from Uruguay, crab meat, beurre blanc sauce & shrimp marinated w/anticucho sauce served w/rustic mashed potatoes. In the same center, Seasons 52, offers a three-course Restaurant Week dinner menu, featuring a creative mix of wood-grilled filet mignon, roasted half chicken or wood-grilled pork tenderloin. Roadster Grill in Bellaire has closed. For 14 years, the restaurant had operated in the heart of Bellaire’s commercial district where Bellaire Boulevard and Bissonnet intersect. The Roadster property, 5210 Bissonnet, was recently purchased by Sion and Michael Saghian, the father-and-son team of SagsTex, Inc. who have owned the nearby Brisket BBQ in Bellaire for 35 years. The new owners of the Roadster property painted the blue building a cool bisque color. The Roadster building was formerly occupied by a Taco Bell. Transwestern has announced Lúa Viet Kitchen is opening its first location at Alabama Row, a new development underway at West Alabama and Mandell in the Montrose area. Transwestern’s Alex Kelly, the exclusive advisor for Lúa Viet Kitchen, represented the fast casual Vietnamese restaurant in its 2,500-SF lease. The designer for the restaurant is MC2 Architects, who also designed MF Sushi in Houston’s Museum District. “The market is missing a fast casual concept that serves delicious, authentic yet modern Vietnamese food,” said Nick Nguyen, co-owner of Lúa Viet. Lúa Viet Kitchen will feature cuisine made from fresh and locally sourced ingredients. All recipes will be prepared without MSG. Instead, look for quality, organic ingredients, antibiotic, hormone-free chicken and beef. Lua Viet Kitchen is set to open late in 2017.